U.S. congressman and mayor of New York City, Fiorello Henry LaGuardia was born in New York City. He was with the American consulate in Budapest, Hungary and Trieste, Austria, 1901-04, and at Fiume, Hungary, 1904-06. From 1907-10 he was an interpreter at Ellis Island, N.Y. He began law practice in 1910 in New York City. A member of the 65th and 66th U.S. congresses (1917-19) and 68-72nd congresses (1923-33). 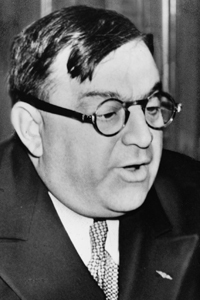 LaGuardia served three terms as mayor of New York City, from 1934-45. In 1946 he was special U.S. ambassador to Brazil, and director general of the UNRRA the same year. In World War One he was in the U.S. Air Service, achieving the rank of major. He commanded the 8th Centre Aviation School and was attached to night and day bombing squadrons on the Italian front. As a congressman, LaGuardia championed greater immigration and removing U.S. troops from Nicaragua; supported the rights and livelihoods of striking miners, impoverished farmers, oppressed minorities, and struggling families; and fought for progressive income taxes, greater government oversight of Wall Street, and national employment insurance for workers idled by the Great Depression. Historians have recognized LaGuardia as the greatest mayor in New York City history, and perhaps the greatest in the United States. Life member : October 17, 1933 Garibaldi Lodge No. 542, N.Y.C. Source: Denslow, 10,000 Famous Freemasons (1959) vol. iii.